Here a short research about bubble performers from the past. 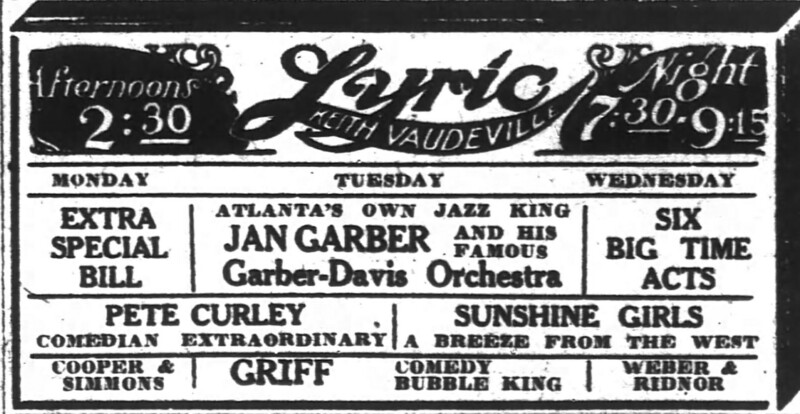 it include all the information that I found about performers from the Vaudeville era (before the II WW) approx. from 1905 till 1939 and after II World War, from 1948 till 1956. I do not include here modern master as, for example, Tom Noddy or Pep Bou, because this part it is dedicated mainly to the past history. 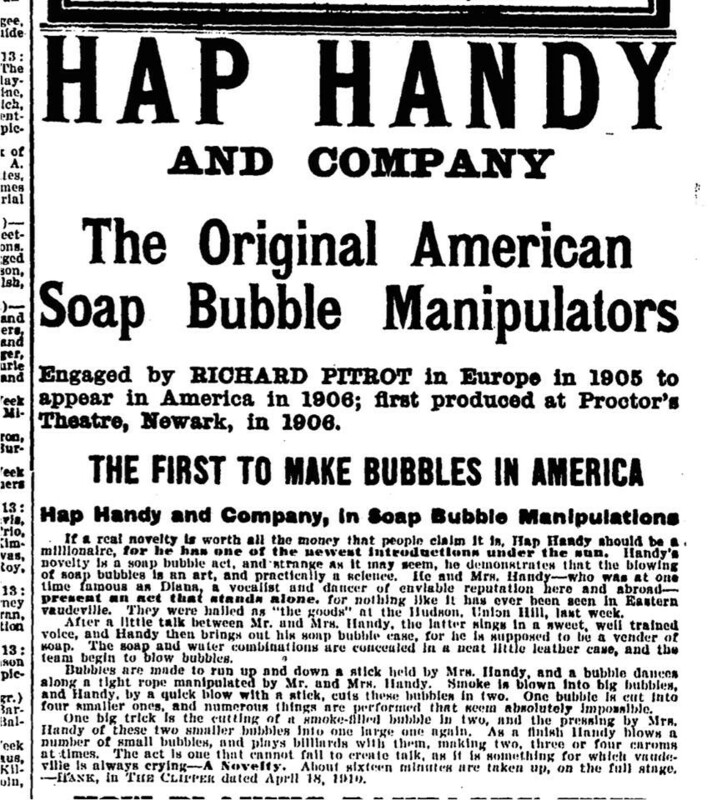 HAP HANDY & Co. that billed his act as "Soap Bubble Manipulator", his the first of which you can read information here (although all was operating more or less in the same period). The act was composed of different effect mainly manipulating bubbles (as from the title). He was entering the stage with a suitcase, dressed as a soap seller, and, then, when he opened his case he started to produce his effects. From newspaper we read that "Bubbles are made to run up and down a stick..,.bubbles dance around a tight rope...,Smoke is blown into big bubbles and handy with a stick cut these bubbles in two." 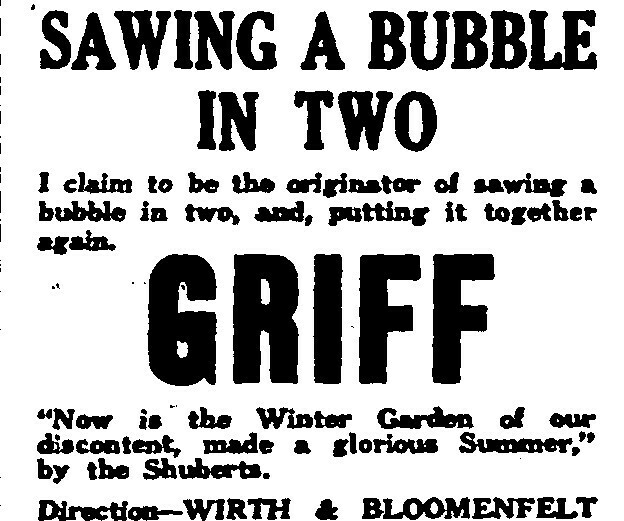 it is possible to read that he was cutting a big bubble in two and, after, to put together these bubbles in one, an effect still performed today. From this description it is possible to understand, or at list look like, that he was mixing some magic effect with bubbles. From some advertising found in newspaper It seem that he was touring also in UK. 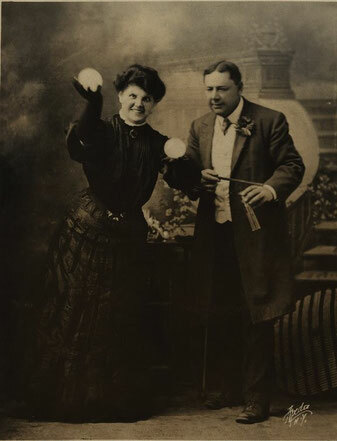 OLLIE YOUNG & APRIL had one juggling act with diabolo and boomerang throwing and a bubble act where she performed dressed as Pierrot and Pierrette. 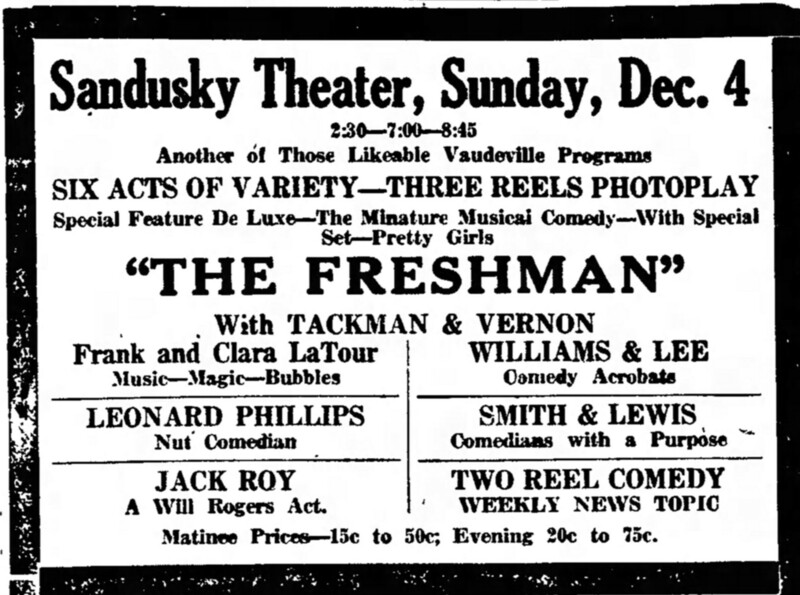 They billed the act as "Ten minutes in Toyland" that say a lot about the length of the show and the costumes. 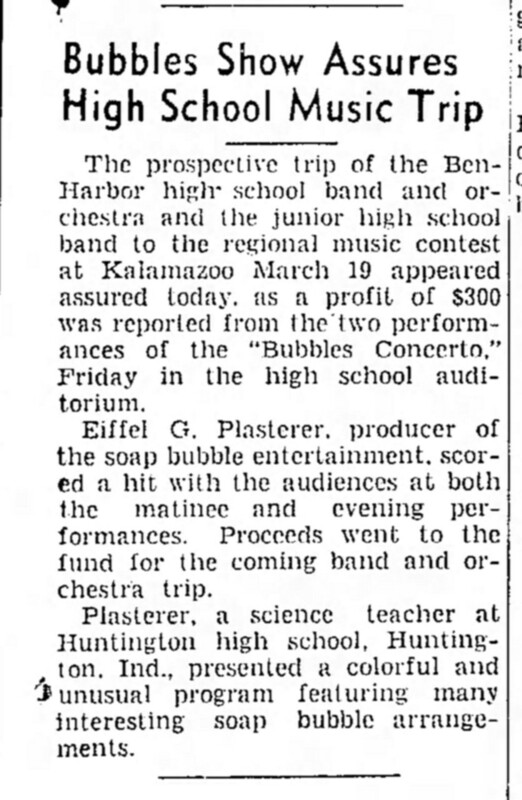 Other times they billed the act also as "Bubbleland" and, more often, as "Scientific soap bubble experts" (this make me to think that they took a lot from the repertoire of "science demonstration" very popular at that time). They was also playing in Europe. 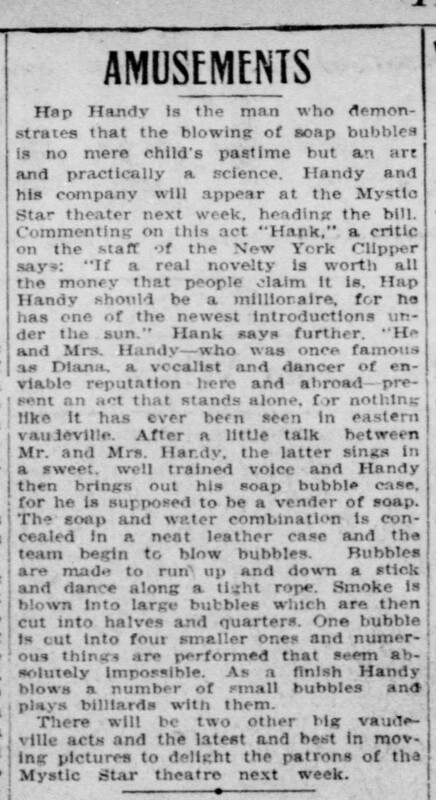 The description of their act from the press that I could find are that "They inflate large bubbles with smoke, producing amazing effects", that they made a big bubble, divided in two and put it together as one (this prove to be a classic at that time, as Hap Handy and Co. was doing also it and Griff too. Today it is an effect still widely performed), that they made a bubble to explode on fire and that, at the end of the act, they was playing billiard on miniature billiard table covered with felt. 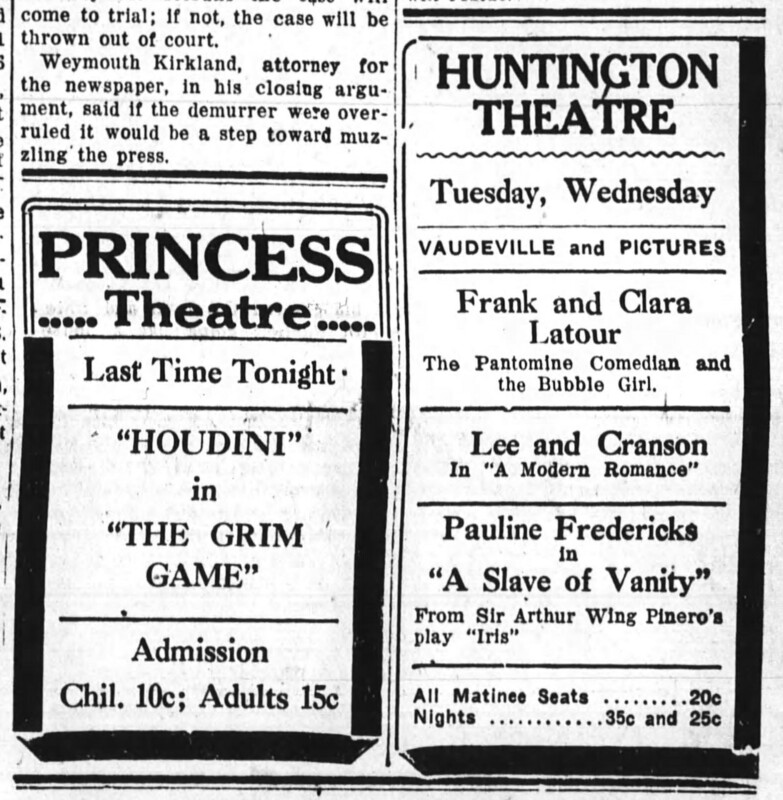 All in all had to be an interesting act looking the high number of playbill that appeared in newspaper and that demonstrate that they were on high request in the Orpheum and in the Pantages, two of the biggest circuit of the vaudeville. 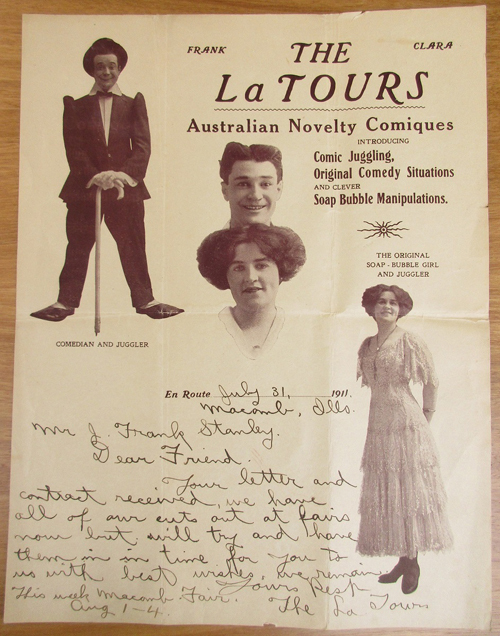 FRANK & CLARA LA TOUR, (stage name of Frank La Tour and Clara Bussing Brown, originally from Decatur and Effingham) had also an act mixed with Comedy & pantomime. 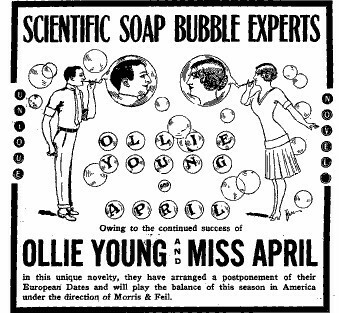 Most often they billed the act with the name "The Bubble Girl", probably only April was doing the bubbles; in an article from 1915 it appear that she was doing bubbles already 10 years before with his uncle. Very hard to find pictures from this period and description of their act, but from their promo image (on the side, from their tour in Australia in the 1911) look more like they was working on a comedy/funny way also because Frank was a Pantomime comedian. 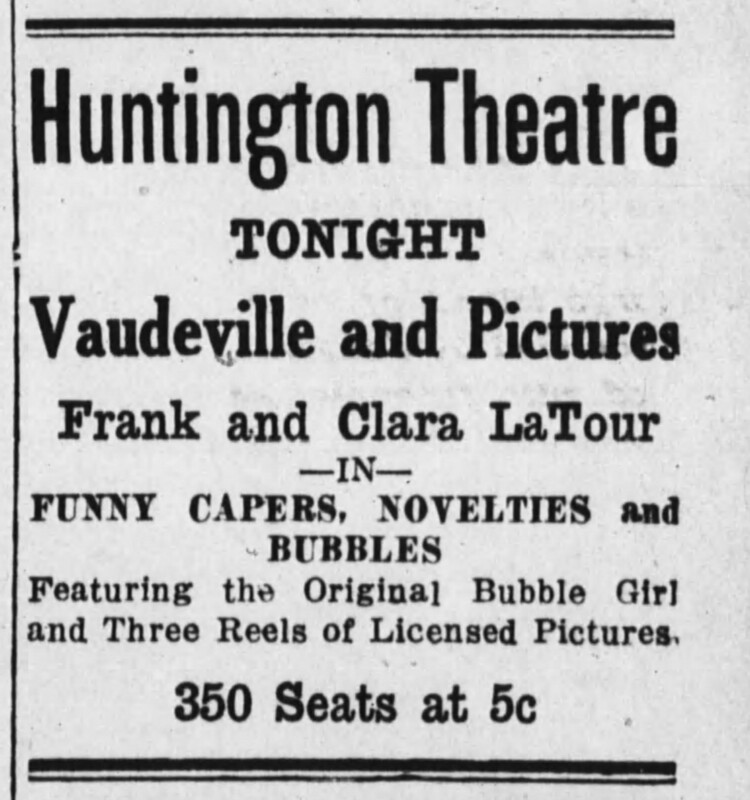 In one advertising we read: "Frank & Clara Latour MUSIC - MAGIC - BUBBLES" This make me to think that they was also performing magic in their act or, maybe, combining it with bubbles (check again the part of this page about BUBBLE & MAGIC). 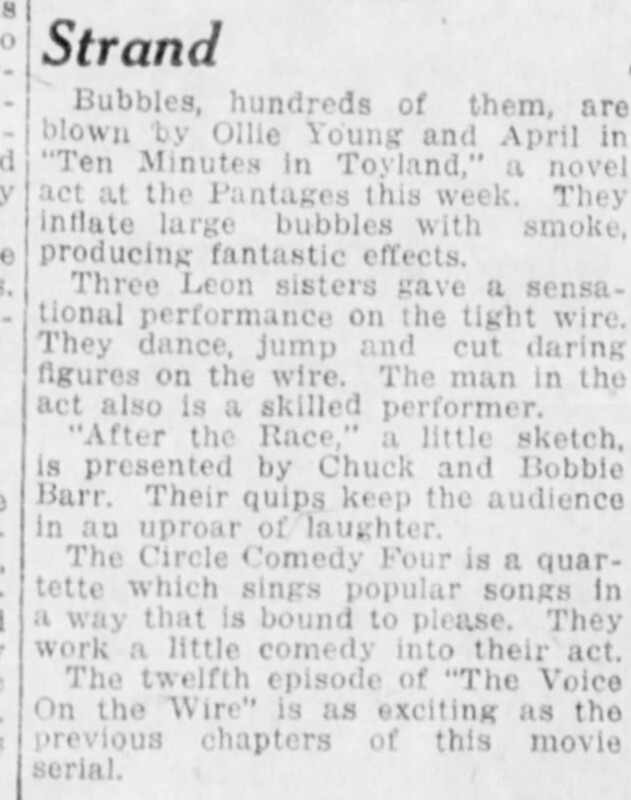 Very hard to find more description of their repertoire with bubbles, the only thing that I found interesting appear in this article of the Oregon News ( Oct. 6 - 1919) where it is written that Frank produce bubbles with a pipe that Clara balance on her parasol and also that Frank ad "burlesque" to the act (he was a skilled pantomime comedian). 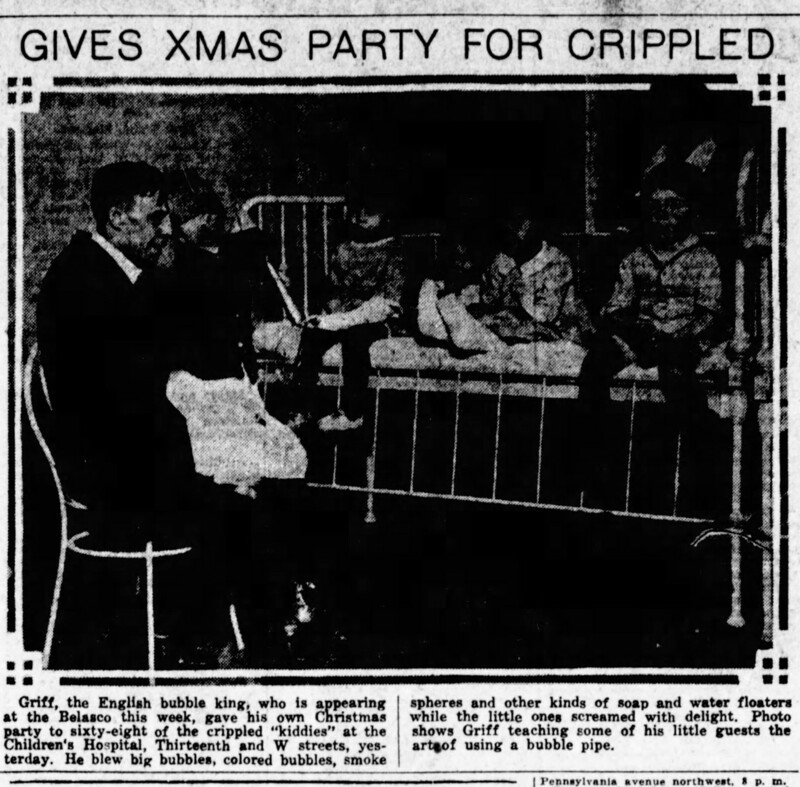 In an interesting article of 1923 it is possible to read that Frank was originally a Juggler (seem to be a strong connection between jugglers and bubbles at that time !) 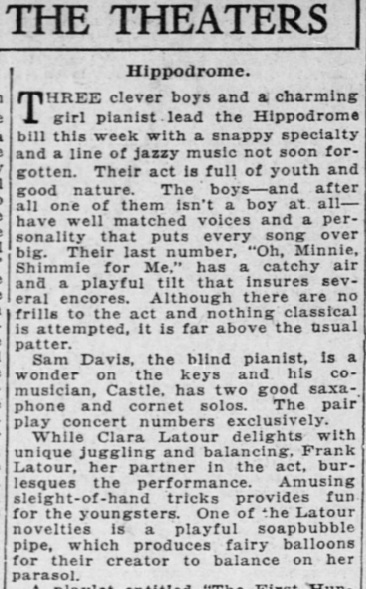 and that by 1923 they had already toured the world, including New Zealand and Australia and that they wanted to work for a year or a bit more, then to retire (probably they also did it, they started their career as a duo in 1902 but it is hard to find record of their act after 1926. 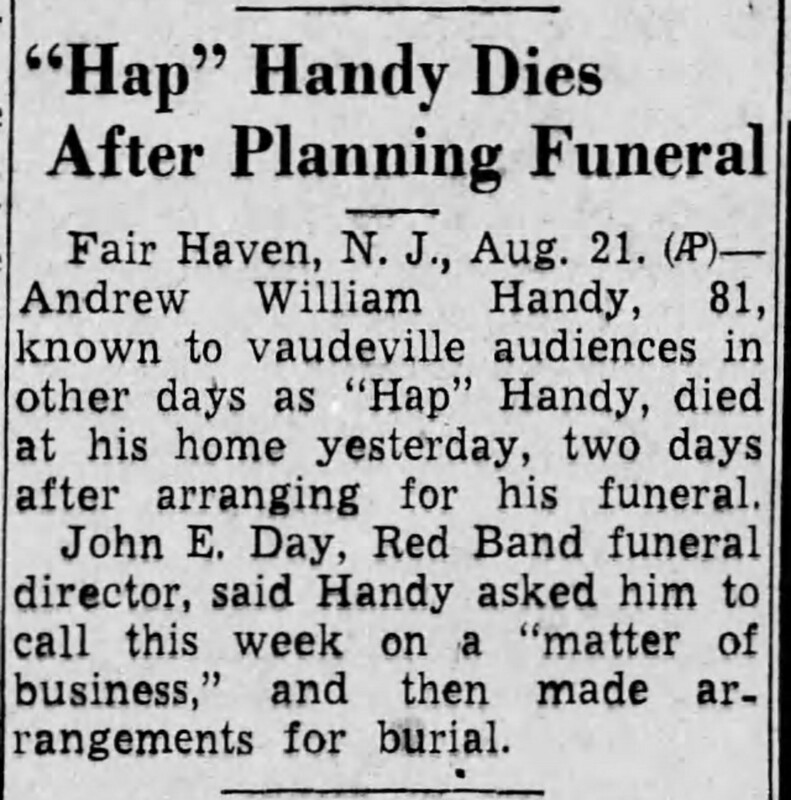 There is only one article 10 years later in 1936 ans some short note about Frank La Tour appearing as Juggler in the 1949-50 but look more like this was a "time filling" as Frank in 1950 was probably around 65-70 years old). They also say that they had a good career during the years and that saved enough money for to retire. 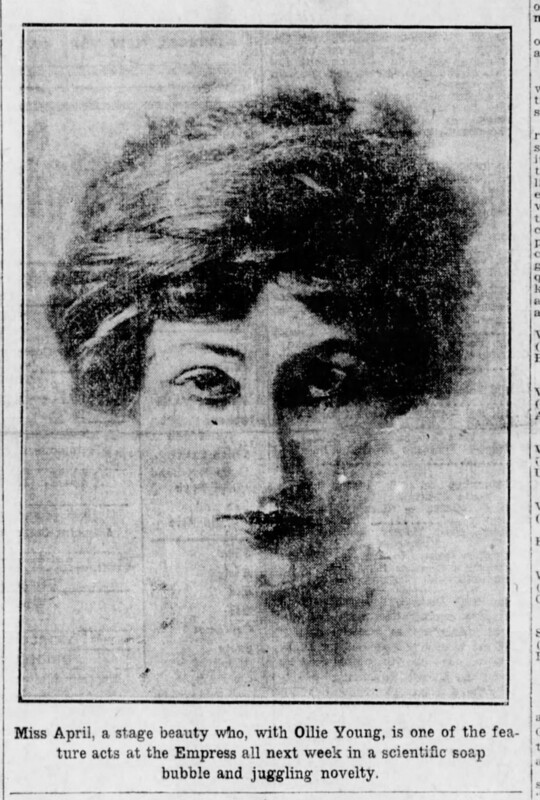 They also had a daughter (eventually born in 1909 as the article say that was 13 years old at that time) that make me to think that at that time (1923) they where between 35 and 40 years old, but I could not find precise information about date of birth/death. 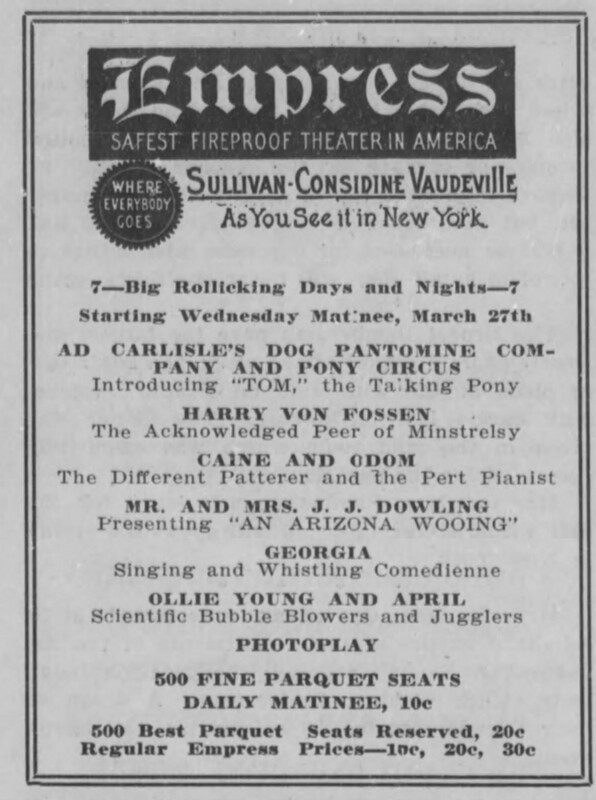 Often they worked as opening act before motion pictures, a thing that started to become more and more popular at that time, until the movies took over the vaudeville signing his decline. Another artist popular at that time was from UK and used the stage name of GRIFF The Bubble King. 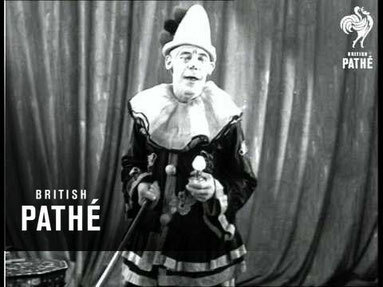 It is very interesting because he appear in a couple of video made at that time by the Pathe Co. and showing him doing his act. 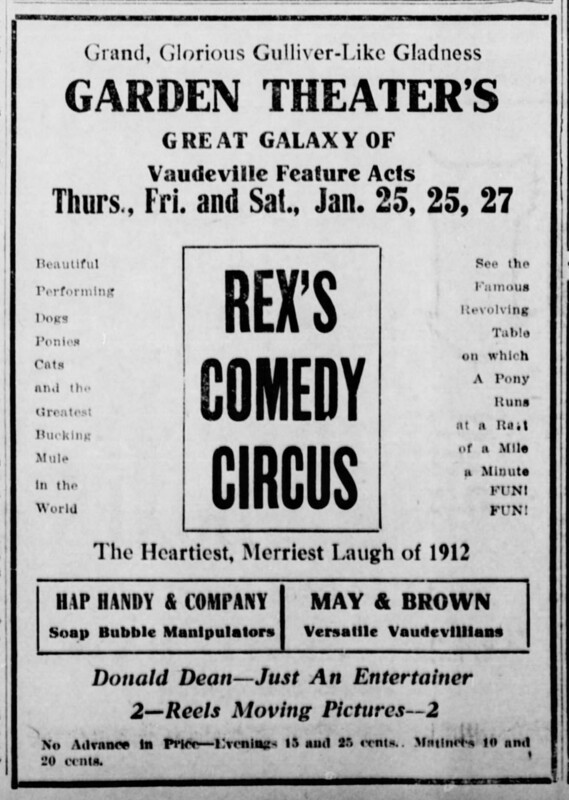 Also it is interesting that in the late '20 he was selling his act and the right of it in USA/CANADA, another example that show how selling/trade of vaudeville act was very popular at that time. Griff was also a Juggler, that say again how big was the interest for bubbles between juggler at the time..., he dressed also like a Pierrot, quite funny to see today a Pierrot smoking a cigar, but, then, this was another era. From his repertoire we can see that he was performing effects like cutting a bubble in two, merging two bubbles in one with one filled with smoke and the caterpillar effect with one bubble filled with smoke; effect still very popular today. It is also interesting to see him using also foam. 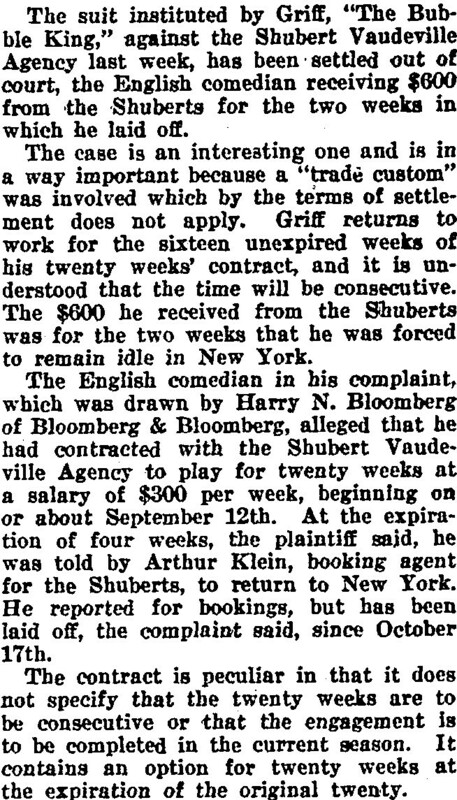 Griff show to be a very interesting character: he was very good in promoting himself as many article appear about him, one even about a lawsuit to an agent that did not pay him, from this we can understand that he was getting 300 English Pounds per week (1921), roughly the equivalent of 15.000 Euro of today, maybe more, as it is not easy to convert value from the past; this tell us that the Music hall / Vaudeville was a very profitable circuit for some performers. Another interesting moment it is when Griff take chance of the big noise made from the lawsuit between Horace Goldin and Selbit for the copyright of the Illusion "Sawing a woman in two" for to make promotion for himself. Those of you who are magicians and/or know a bit about this claim, know also that it was a kind of huge "scandal" in the showbiz and it was known also from the audience. 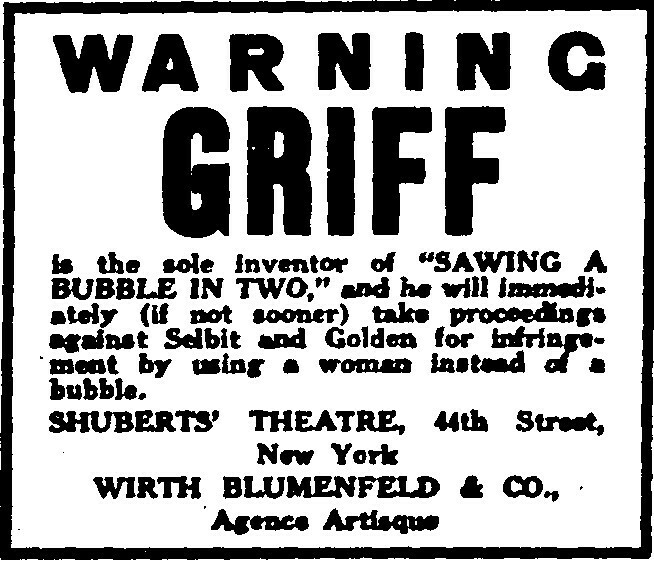 Griff, a bit with irony, and a bit for to make provocative advertising (some of other bubble performers, like Hap Handy, was doing this effect regularly) claim to be the originator of "Sawing a bubble in two" and putting back together and in another menace ironically of lawsuit Goldin and Selbit because they copied his idea and adapted to a woman... ! Read well the article on the side, this it is the only that I could find about him, and it tell a lot: names, dates, even some rough description of the act (and a note regarding Ollie Young)... but, except that, there is nothing else on the press. I searched for 2 years, then I let it, because he seem to vanish...in a bubble ! 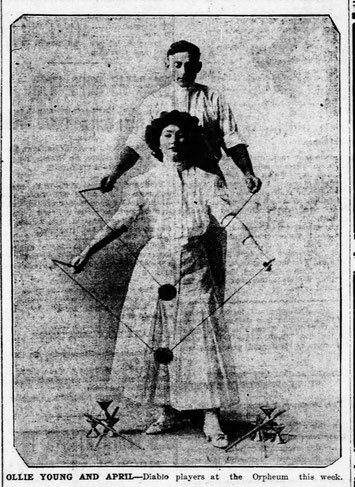 I try to make a quick research also about the juggler to which he seem to have leased the show "J.P. Randolph, a Philadelfia Juggler" as written in the article, but I could not find any news. The fact that he describe his bubbles as "without water and without soap" and, later, that " any colored bubble that it is desired" make me to think that he created a product very similar to the modern "plastic bubbles" the bubbles that kid can blow with a special tube and a special paste (very popular in the '70, recently they come back to the toys market), but it is just an idea. Should any reader of this fact have or find any information regarding this little mystery, just let me know and I will be happy to ad here everything !! 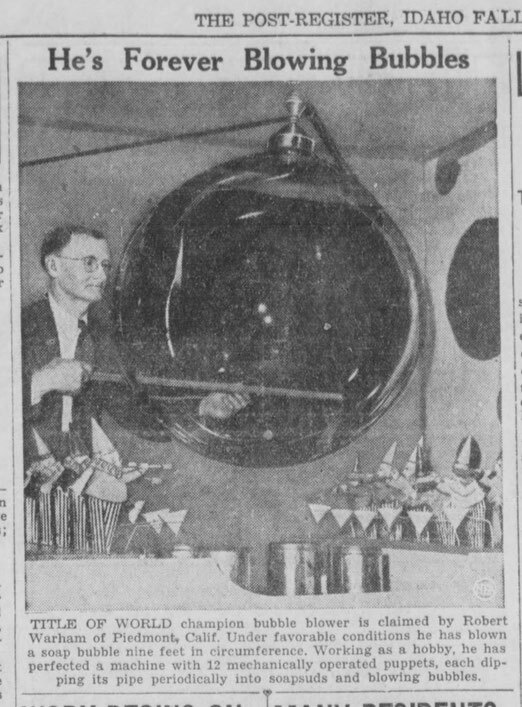 Warham was not a professional bubble performers, he was a passionate hobbyist that after many years of experimenting with bubbles made a world record in the 1939 blowing a bubble with 7 to 9 feet circumference (some article say 7, others report 9 feet). That's around 70-80 cm in diameter, pretty big for the times. 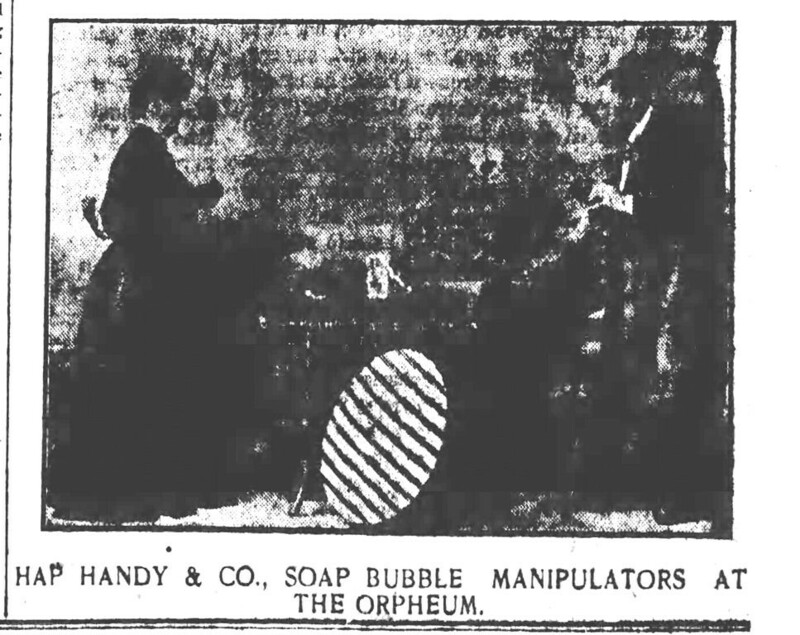 On the picture on the left, you can see him blowing the bubbles and with his automaton bubble machine: he was the inventor of a machine with many little mechanical puppet / bubble blower. 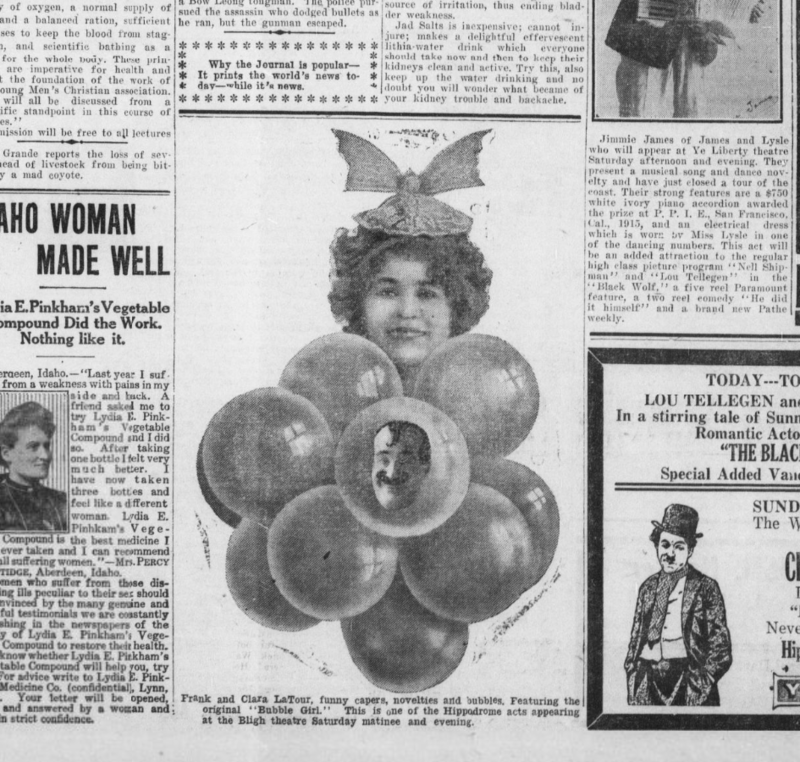 There are not many other information about him, also it is difficult to say if he decided to work full time later, or he continued it as a hobby: the Vaudeville circuit was dead and the war was at the door, most probably the second option was the choice. One thing that must be noted it is that in one article he say that he knew about a performer from Australia that had a bubble act and become rich working in Music Halls in Austria. 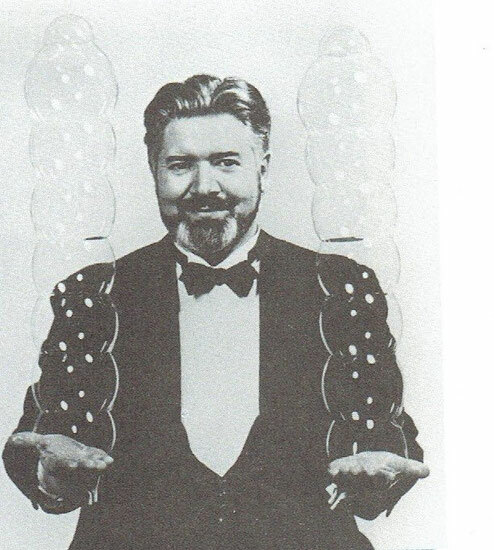 I try to search about this performer, but I could not find any information about him, it may be possible that the performers working with bubbles was even more than those who I list here. There are not many information about him, just some articles writing more or less the same things. 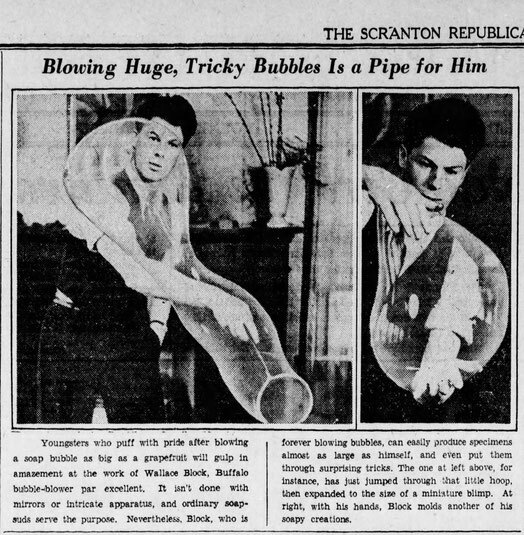 It is not possible to understand if he was a professional bubble performers (in the meaning that was his full time job) but for sure he knew something about it, just look at the pictures on the article on the left and remember that it is 1936 ! It is interesting to see the big bubble in the hands. 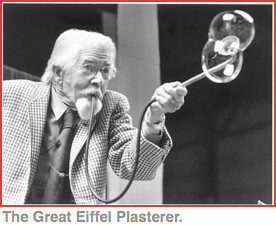 EIFFEL PLASTERER and his "Bubble Concerto"
Plasterer is recognized today as the first big bubble performer of modern days. 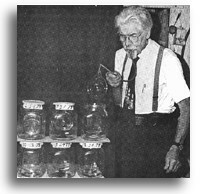 He was a retired teacher that discovered the joy of performing bubbles when making experiments for his student. The hobby become so strong that when he retired from his job as teacher, started to perform full time his "bubble Concerto" a 2 hours (!) show filled with many effects, assisted by his daughter. There are so many innovative effects in his show that we could call him the "father" of modern bubble art. There is plenty of information on the web (fortunately) about him, including videos and interview, that it become too long to list everything here. As you can see in the picture on the right, he was using extensively Helium but also Hydrogen for his exploding bubbles. Although there are earlier record of the effect known today as "Kid in Bubble" (look the section CLASSIC EFFECTS OF PUBLIC DOMAIN and the beautiful draw and notes from the book of M. Nugent, at the beginning of 1900) he is the first we know that was able to put a person inside a bubble (and there is a beautiful video where he put David Letterman inside it, in the '80). 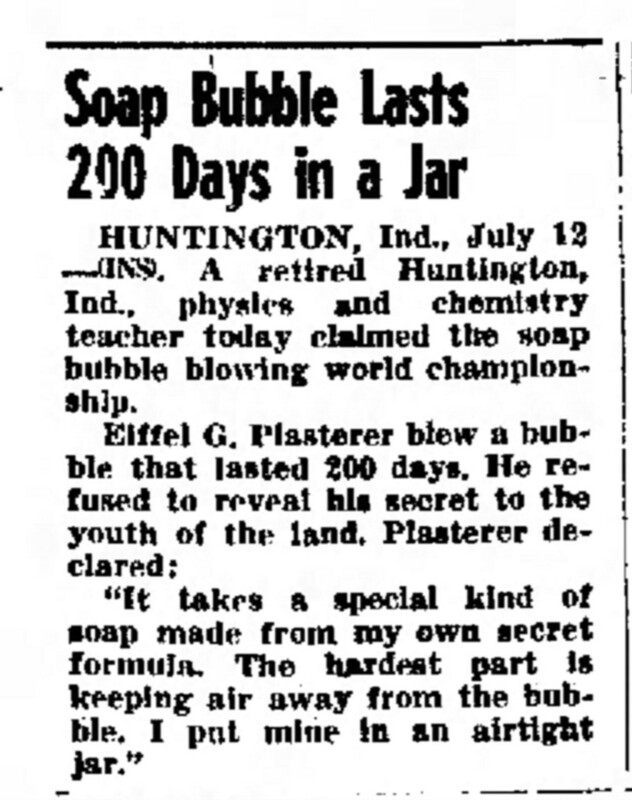 He created also a special bubble solution that helped him to keep bubbles lasting not only for days but even for years !